Paella is a classic Spanish seafood dish from Valencia, Spain. Created in a wide pan called a "patella", Paella is a communal/shared dish that is made from short grained rice flavored with saffron and topped with steamed shellfish. The recipe can change widely from local village to village and include regional flavors and ingredients. The combo paella adds different meats like spicy chorizo sausage, chicken, veal and rabbit. Shellfish and fish filets can also be added in many combinations to add a regional flavor. Place the stock in a saucepan and bring to a boil. Add the saffron and paprika and simmer on low heat. Add the olive oil to a very large skillet. When the oil starts to smoke, place the sausage into the pan, brown on all sides and then remove. Add chopped onion and bell peppers and sauté until tender. Add the rice and sauté until it turns white. Add the chorizo back to the rice mixture, then pour in the boiling stock and add the peas, tightly cover the dish and simmer for 10 minutes. Carefully remove the lid, add the clams and mussles then simmer covered for 5 minutes. Again, carefully remove the lid to the pan and place the shrimp into the rice. Cover and cook for 7 minutes or until the rice is tender and the shellfish are open. While the shellfish are steaming, place a large skillet over medium heat. Add the olive oil to the pan. Season the split lobster with salt and pepper. 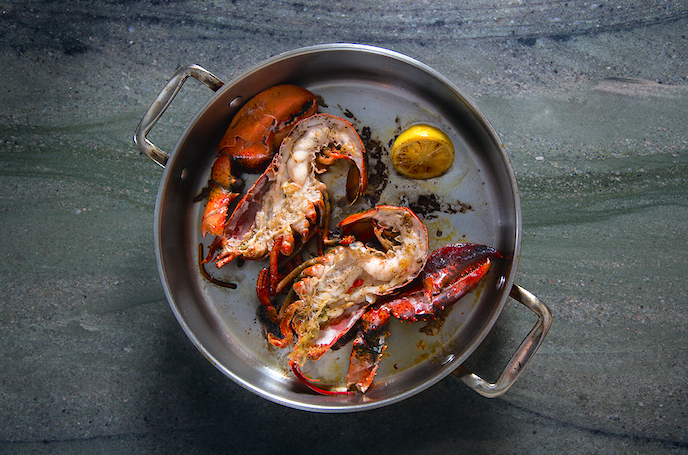 When the oil smokes, place the lobster into the pan and sear on both sides until the tail curls up. Serve the Paella hot, and garnish with fresh tomato, lemon and parsley. Pre heat the oven to 425 F. Pre heat a large skillet then add the oil to the pan. Season the halibut with salt and pepper, dredge lightly in flour, dip in the eggs and then place in the pan. Cook the fish for 3-5 minutes or until browned lightly, turn the fish and repeat. Place the fish on a baking sheet and bake for 5 minutes. Wipe the pan clean then add the butter to the pan. Place the shallots, potato, corn, bell pepper into the pan and sauté until soft. Add the crab toss with the vegetables and then deglaze the pan with wine, simmer for 2 minutes and then add the cream. Simmer for 5 minutes; add the tomato and then season with salt and pepper. Place the fish on a plate, top with the crab mixture and garnish with fresh herbs. Remove the skin from the cooled potato and shred finely on a grater. Place 1 cup of flour and salt in a bowl and make a well in the middle. Place the potato, ricotta and egg in the well and start to mix. Lightly knead the dough on the floured surface adding a small amount of flour until it is light and does not stick to the surface. Cut off a small portion of the dough, roll into a snake, then cut the snake into small 3/4-inch portions and place on a sheet tray and freeze for 10 minutes. Pre heat a large skillet over medium heat. Add the butter to the pan, then add the peas and toss for 3 minutes. Add the cream and bring to a simmer. Boil the gnocchi in salted water until they float to the top, about 90 seconds. Add the gnocchi to the sauce and cook until the sauce is thick then toss in the fresh herbs and season with salt and pepper. Season the chicken on both sides with salt and pepper and then lightly dredge in flour, shaking off any extra. Place a large skillet over medium heat and add half of the butter and oil to the pan. When the oil starts to shimmer, place 3 pieces of chicken into the pan. It should sizzle right a way. Cook for three minutes or until the bottom starts to brown lightly. Turn the chicken and repeat. Remove the chicken from the pan, add the rest of the butter and oil to the pan and repeat with the remaining chicken. Remove the chicken from the pan, then add the onions and cook until soft. Add the capers, lemon juice and chicken stock stirring up any brown bits from the bottom of the pan. Place the chicken and any juices back in to the pan and simmer on low heat, until the sauce is thick, about 5-7 minutes. Stir in a tablespoon of butter into the sauce and then season with salt and pepper. Garnish the chicken with fresh parsley and serve with pasta, steamed vegetables, potatoes, grains or rice. Lobster is generally seen as a super gourmet dish, very expensive with not a lot of return on investment. While it is generally steamed and served with melted butter, I find lobster to be kind of boring and bland. While steaming is a classic prep, it does nothing for adding flavor to the delicate meat of this fiesty crustacean. Like a great steak, I like to pan sear split lobsters in olive oil with a little salt and pepper for the ultimate experience. Remember, if you have live lobsters, place them in the freezer for 20 minutes to stun them. If you have frozen tails, run them under clod water to defrost them and dry them very well before you start to cook them. Very carefully split the whole lobster lengthwise through the whole body, remove the claws form the body and crack open with the back spine of a heavy knife. Season the meat with salt and pepper and set aside. Pre heat a large heavy, skillet over medium/high heat. Add the oil to the pan, when it smokes, place the lobster in the pan, meat side down. Cook for 5 minutes or until golden brown on the meat side. Turn the lobster over to the shell side and continue to cook for 5-7 minutes. The lobster is done when the shell will turn bright red and starts to curl up, the meat will also come out of the shell easily when tugged with a fork. Garish the lobster with a squeeze of lemon and a fresh chopped parsley. This dish goes great with steamed potatoes, risotto and grilled vegetables. Pics by Hank Vorher - Yes I made this, and it tasted fantastic! Take the steak out of the fridge and let it come up to room temp, about 30 minutes. Pre heat the oven to 450 F. Dry the steak very well with paper towels and season both sides well with salt and pepper. Place a very heavy skillet, preferably cast iron over medium/high heat and let sit for 3 minutes until super hot. 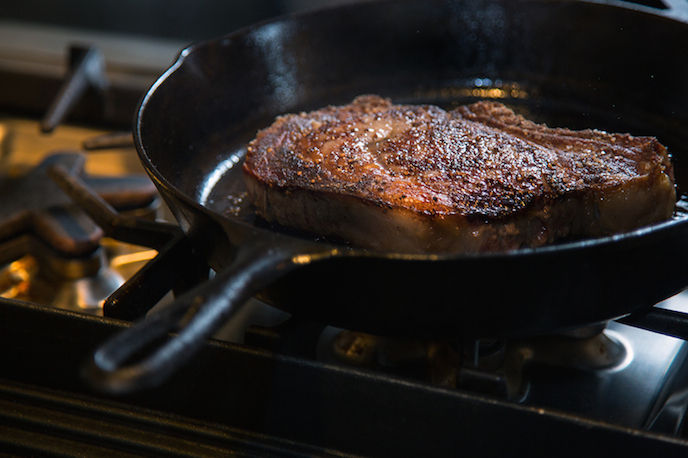 Add the oil to the pan, when the oil starts to smoke, place the steak in the pan. DO NOT TOUCH THE STEAK for 5-7 minutes, it will be smokey, so turn on your fans and open some windows. When the steak has cooked up the sides and is golden brown on the bottom side, turn the steak over. Cook the steak for 5 minutes, DO NOT TOUCH, then place the pan in the oven for about 7-10 minutes or until it reaches your desired doneness. If the pan is not oven safe, remove the steak and place it on a baking sheet. The steak is cooked to medium/rare (about 135 F - 140 F) when the middle is poked with you finger and is slightly soft with a little firmness. Rare steak (125 F - 130 F) is very soft, you can feel the undercooked meat and well done (165 F - 170 F) is completely firm. I like my steak at about 140 F with a crispy outside and a just cooked through center. This recipe for cast iron pizza will beat any brick oven pizza joint by miles. 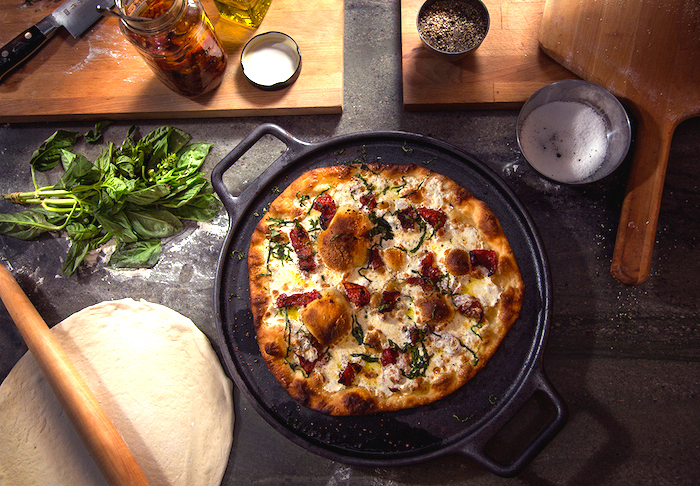 The cast iron gets super hot and creates a crispy crust that can only be found in pro pizza ovens. I used a large 14 inch cast iron pizza pan that can be found at a Walmart, Target or Amazon.com. You can also place this pan on your grill, jack up the heat to high and get awesome pizzas throughout the year! You can top your pizzas with all kinds of stuff. I like grilled and fresh vegetables, pulled pork or chicken, BBQ sauce and assorted meats and cheeses. Get Funky With It!!! Lastly, Big Ups to my buddy Hank Vorher, who took this great picture! Yes, I really made that pizza. First Step - Pre heat the oven to 525 F or as hot as hot as it will get. Place a large cast iron pizza pan on the bottom oven shelf and let it get hot for 30 minutes. Lightly dust a counter top or large cutting board with flour. Slowly roll the dough out with a rolling pin until it is very thin. Top the pizza lightly with sauce, cheese, a pinch of salt and pepper, then drizzle with 1 tablespoon of olive oil. Carefully open the oven and shake the pizza off the peel or sheet pan and on to the cast iron pan. Close the oven and bake for 5 minutes. Check the pizza for bubbles, and pop them with a fork if they appear. Close the oven and cook for another 5 minutes or until the cheese is golden brown and the crust is crispy. Garnish the pizza with fresh, chopped basil. Oil a large cast iron pan very well. Roll out the dough the size of the pan and place it in the pan, pushing the dough up the sides to form a deep crust. Top with sauce, leaving an inch around the sides with no sauce and then top with cheese and assorted toppings. Season with salt, pepper and drizzle with olive oil. Place on the bottom of a 525 F oven and bake for 15-18 minutes or until the cheese is bubbling and golden brown.Top with fresh copped basil and enjoy! 1. Purchase flavorful and inexpensive cuts of beef like skirt, flank, sirloin, chuck, and chuck eye. 2. Cut the beef into small cubes, trim any silver skin or tendons, season well with kosher salt and freeze for one hour. 3. Place the beef into a food processor with 1-2 strips of bacon for added flavor and fat. 4. Pulse the beef a few times until you have a course grind. Do not over chop, a few small chunks of steak is all good. 5. Portion the beef with a large ice cream scoop and flatten. Season with a little fresh pepper then fry or BBQ to medium. Pasta carbonara is a fantastic pasta dish perfect for the hot summer months. This Roman recipe is created by tossing hot pasta with a mixture of egg yolk, bacon and parmesan cheese. Tossing the hot pasta with the egg and cheese mixture makes a smooth and creamy sauce that is easy to prepare and tastes incredible. During the summer months I like to add fresh vegetable that become available like asparagus, greens, bells peppers, zucchini, squash and corn. You can also add any canned or frozen vegetables that you like. To boost the bright summer flavors, don't forget to add the lemon juice and fresh herbs. Place a large skillet over medium heat and add the oil to the pan. When it smokes add the vegetables and sauté for 5 minutes then remove from the pan. Add the bacon to the pan, brown well, then remove it from the pan then set aside. Bring a large pot of salted water to a boil and cook the pasta to al dente. Place the egg yolk, cheese, pepper and lemon juice in a large bowl and slowly whisk in 2 tablespoons of the boiling pasta water. When the pasta is done, drain well and toss with the egg mixture, vegetables and bacon then serve immediately. Garnish with fresh chopped parsley or basil. If the cheese does not melt all of the way, you can simmer the pasta in 1/2 C of the pasta water over low heat until the cheese melts. Place a large skillet over medium heat and season the chicken in the salt and pepper. Mix the bread crumbs and pecans together. Lightly dredge the chicken in flour, egg then press into the pecan mixture. Place the butter in the skillet and when the foam subsides place the chicken into the pan. Cook the chicken on one side, until golden brown, about 4 minutes then turn and repeat. When the chicken is cooked through, remove form the pan. De-glaze the pan with the wine and chicken stock and reduce by half. Stir in the mustard and cream then season with salt and pepper. Serve the chicken on a platter, drizzle with sauce and garnish with herbs.